Market-Share: Give me a Job! I was managing a booth for my client at Career 2009 almost the entire of last week. And in the past 4 days, I had been going through repeatedly in my mind how I should write this entry. There are indeed lots to say and a lot to reflect on our society and people. Let's began with the turnout of the event. It was an astounding success, there were more than 500,000 attendees throughout the 4-day exhibition, as reported by The Straits Times. It was the first time in history that job seekers were queuing like breadlines and swarming in like bees. People were rushing and crowding in every single booth literally demanding for application forms. At my booth, we were an informative and awareness exhibition, hence do not offer direct employment opportunities. Despite we explained the forms at our counter are simply survey forms, people were queuing to fill those in. Apparently, many people have the impression that if they fill in every single form in the entire exhibition hall, someone will hire them. Which you and I know, it's not true. But it was good for me, I fulfilled my KPI, filled up 4,000 forms in less than 2-days. I was however, a little depressed at this scenario I'm observing. 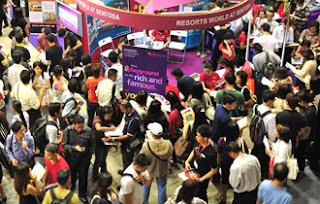 Over the first 3 days, we also have credible speakers giving talks at our booth on the potential of the tourism industry and the current openings available at their organisations. The major attraction are the 2 Integrated Resorts that will be opening end 2009 and first quarter of 2010. Together, they are likely to offer more than 20,000 jobs in all. In this career fair alone, there are almost 2,000 openings that almost 20,000 people are vying for. As the Vice-President for Casino Games in Marina Bay Sands (MBS is one of the much anticipated IR, first to open in 2009 Dec) was giving a talk on the job scopes and potential openings that will be offered in this hiring exercise, I walked to the back counter of my booth where probably about 10 people are filling in the application form for MBS. I invited them to come forward and listen to the talk. Before I could finish, all of them have walked off. (And obviously without a smile nor a thank) . And you can't help but wonder, if one aren't even interested in what his/her potential employer has to say. What makes him/her thinks the potential employer wants to hire them? In the report by The Straits Times on 7th May 2009, a fresh graduate was quoted saying, "'It's a tough year ahead. I have no particular preference for job positions, as long as I can get one." Indeed, that is an encouraging mentality, to manage expectations in tough times like this. But in an employer's point of view, that would be the very reason why I will not be hiring someone like him. WHY? You may ask? Recession is really the best time to hire talents. There is an abundance of talent in the marketplace as compared to the good times where everyone is trying to vie for the best. The cards now lies in the hands of employers and they are free to pick whomever that may best benefit their business, without paying outrageous salaries or incentives. At the wide choice of talents available, why should I (as an employer) hire someone who has "no particular preference or interest" versus someone whom values the position as an advancement to his/her career path. Why would I hire someone who "just need a job" versus someone who really is interested in contributing? The problem with many job seekers is always the same old issue. As much as you are concern if the company can pay for your next meal, the company is concern about how much value-add you can give them. Hence, instead of thinking, "I have no preference." Start thinking, "How do I make myself THE preference." I came across a lady, well-groomed, somewhat well-educated, English speaking, probably late 30s to early 40s, who came to enquire about the two IRs. She asked, "There's Marina Bay Sands and Resorts World there, where's the third one?" From her accent, you know she is a true blue fellow countryman. We looked at her with slight disbelief and said, "Mam, there's only two IRs in Singapore". Then, she asked, "Oh... then is Resorts World Sentosa in Sentosa?" Honestly, how do you expect me to answer a question like that. I really don't wish to humiliate her intelligence. But it suddenly dwells upon me, in the past 10 or 20 years where she held her last position, did time stood at a standstill? Perhaps losing that job was a push back into reality. The day she left the doors of those offices, it was "Welcome to the Real World". How can anyone not take interest into what goes on around them? Apparently, plenty of people choose to do things only when there is a need to. Now that there's a need to find a job, then they realise opportunities don't lie around waiting. It must be sought after. Little did people realise, knowledge and relationships takes time and effort to be acquired. It does not happen overnight. I have an intern from my company who asked a peer after one of my presentation, "What is a continent?". No, she's not in High School (even high school kids should know anyway). A month later, during an appraisal session, I asked her if she had wikipedia or googled the definition of a continent. She replied, "No." So I probed further, "Aren't you curious?". She said, No. I said, "Why not?" And the anticipated answer is, "There is no need to." Yes I know, what is new? The point is. This is obviously not a problem lurking amongst the older generation, as the younger people are experiencing the same bad habits and misconceptions. And may I repeat it has absolutely nothing to do with education level nor academic excellence. Over a BBQ with a friend, he was sharing with me some shocking moments he had whilst giving a speech to a group of MBA students in a local University. He was sharing on the importance of Accounting to Entrepreneurs. A guy, representing the entire cohort stood up and asked him, "What is a P&L? Can you please don't use abbreviations?" Yes I repeat, a group of MBA students asked him that. Another occasion, a friend's cousin was interviewing some University undergrads to take up positions as Intern in an MNC technological company. A dream company for many, which I can't name. One of the top candidates was posed with this question. "What is your passion?" He gave a most astonishing answer. "My girlfriend!" Obviously it doesn't take rocket science to understand how one should behave during an interview. It also doesn't require a PHD to understand basic fundamentals of business like a profit & loss statement. Ignorance is a very scary thing. But the sheer denial of ignorance and reluctance to change is absolutely unacceptable. Many have once heard this famous quote, "For the only thing that never changes is change itself." But few really recognises it. It has become quite clear in the past 40 years that English has become the common and official business communication language in Singapore. However, some non-English speaking older generation have chose to stick with their dialects and mother tongue. I am not saying it's a bad thing. We need to have all these rich cultures and lingual in our community. But somehow, they must understand upgrading is essential in guaranteeing a constant employment opportunity. Should we only start to pick up new skills when we need them? Probably by the time you realise your need, it would be too late to start learning all over again. I would sadly say, the people who are not getting jobs now will not be able to get jobs in the next one year. Employers and the society doesn't owes anyone a living. To change your life, first change your mind. Although I don't deny there are genuine victims of this recession and there are genuine sob stories. But what makes the great difference between one who survives out of valley and one who dwells in misery is really - all in the mind. I think sometimes instead of requesting for a job, one should "make" your own job. Open your eyes and stay open for more opportunities or go get an internship at some company, learn some skills while working for free! Sadly, my dear friend... not many people realise that. If learning is a hassle, I wonder how many actually look beyond the horizon. Well, in another point of view, that gives you a niche! I agree with most all your points made here. People should be intellectually curious all the time, not just when it is convenient. I do find a point of consternation with how you find the answer "My girlfriend!" to be astonishing when asked about his passion. Yes, you should have a passion for your employment, but I don't believe it has to be the driving force in your life. If all you live, eat, and breathe is your job, you're bound for burnout and bound to be the bore of every party. While I understand it may seem a bit of a juvenile thing to say in an interview, I wouldn't discount the answer as foolish (not that you do). I give the man props for answering outside the realm of "classic interview responses." Otherwise, great post and, as stated before, I definitely agree. Be curious all the time, not just when it's necessary. I am in the middle of recruiting a replacement for my current staff who is posting to another team and find the lack of interest or passion common among young people (aged 20-26). When I probed them why are they are applying for the post, invariably the answers are waffly and superficial. So far I only manage to see 1 or 2 out of a dozen or so that have that real interest and awareness about their career choices in a tough market. I've gone through the 97 crisis and dot com crash and those really woke me up to build some real skills that were portable (IT skills, public speaking with toastmasters) and they have come in handy even for planned career moves.